Home > News > Are You Ready For Airport Day? ANNOUNCEMENT: Due to engine failure, the B-17G “Aluminium Overcast” plane will NOT be in attendance at Airport Day 2018. We apologize for the inconvenience. Runway 5k Airport Day officially begins at 10am, but our Runway 5k, which is one lap around ITH’s runway and taxiway, is taking place from 9am to 10am. Sign up to pump those legs of yours and to help the SPCA of Tompkins County, where all Runway 5k proceeds will be donated. Register online here – you’ll be supporting our furry friends just by signing up! After the race, enjoy the fluffiest pancakes, made by the East Hill Flying club. At 10:30am your dreams of being a part of shows like The Great British Bake Off can come true! Just sign up for The Great Ithaca Bake Off by the Ithaca Sunrise Rotary Club, which is sponsored by the Tompkins Trust Company. This will support the Cancer Resource Center of the Finger Lakes. Do You Love Airplanes As Much As We Do? Have you ever wanted to know what it feels like to fly a plane? Throughout Airport Day, the East Hill Flying Club will be providing airplane rides. If that’s not enough, Ithaca’s very own WWI Thomas-Morse “Tommy” biplane will be on display by the Ithaca Aviation Heritage Foundation. Catch it before it gears up for its centennial flight on September 29th! 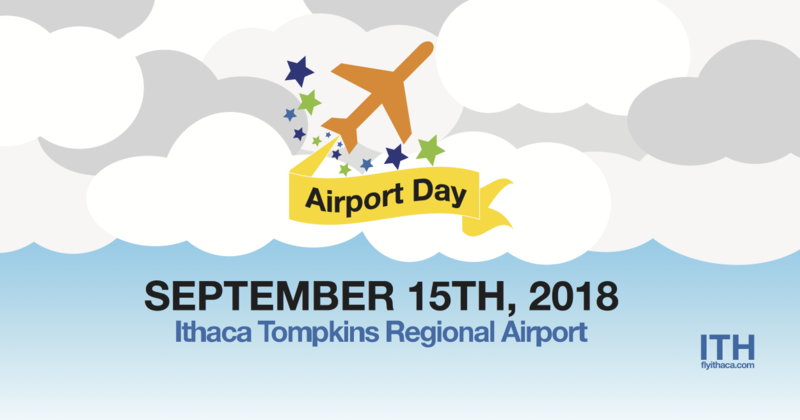 With delicious food trucks, fun activities for kids and parents alike, and of course a wide array of airplanes, ITH’s Airport Day is a wonderful, family-friendly way to connect with the community and celebrate Ithaca’s rich aviation heritage. Let us know you’re coming! Register here so our staff and volunteers can better prepare for your arrival and keep you updated with any changes to the event. Parking will be FREE for the day in the Longterm Parking Lot.